The English translation of this throws me WAY off. When I wrote a rant about this show (link in spoiler section), I got the name wrong. It’s an odd name, and here’s why. A “yuusha” can be thought of as a hero too but, the word brave is used a lot (like Indian braves, etc). So saying “heroes” in the English name just throws me further off. That and I could use an editor, but I’m on my own. Anyway! For my end of fall 2010 anime season reviews, I will be using spoiler spaces very liberally, even when not actually dealing with actual spoilers. That’s fine – this is for people who want a retrospective where I say what was good and bad with honesty and robustness. The score comes down a couple of pegs for the depressing, incomplete plot. It comes down only a couple of pegs because these characters are fantastic, the production values are really impressive, and one of the knocks is simply that we need more of this so that we can see how it ends. Legend of the Legendary Heroes (densetsu no yuusha no densetsu) is ostensibly about the hunt for Heroes’ Relics (yuusha no ibutsu), which would place the “legend” as being about the long-dead heroes. There may have been a history prior to the characters we see on-screen, but make no mistake: they are the legendary heroes, and this is their legend. Ryner, the cursed sorcerer with the most special of a special brand of cursed eyes known collectively as Alpha Stigma; it is revealed late in the first season that there are more than one flavor of these eyes, but Ryner’s are truly special. Ryner absolutely hates “trouble” and his life is seemingly filled with nothing but it. For this reason, Ryner becomes inspired by the ideals of Sion, who through a quirk of fate and the “selection” of shadow powers behind the throne becomes the young “Hero King” of the kingdom of Roland. Sion’s desire is to create a world where the common people can be happy. Born both the son of a king and a lowly commoner, Sion is opposed by nobles, tradition, mountains of paperwork (I am not joking), and the opposition of other nations, but things are a lot bigger than he counted on. In his quest to change the world, he begins making sacrifices – and while they are not all his fault, it is his desire to do good that is the source of his descent into darkness. Ferris, a blond swordswoman and younger sister of one of the powers behind the throne, is forced onto Ryner as a partner. While she has a mischievous side, dark incidents in her past made her have difficulty expressing her emotions. She and Ryner become much closer over the course of their adventures; it is her words to Ryner – that he is not a monster, not to her – that, without exaggeration, saved Ryner’s soul. Ferris constitutes a considerable amount of the humor of the show, being straight faced when committing comic levels of gratuitous violence upon Ryner (who can take a lot) and tragi-comic when accusing him of various acts of ecchiness against her. Indeed, one may get the impression that Ryner exists only to be her piñata – in other words, as her toy for personal amusement. So for a guy who’s allergic to work and trouble, Ryner gets pushed into an awful lot of it. Throughout much of the show, the big idea is for him and Ferris to go around gathering Heroes’ Relics and bring them together, because their might could change the world for good. It is not just that other nations are dedicated to gathering them and foiling this. One nation’s agents are actively going around killing Alpha Stigma bearers – well, that wouldn’t be unusual as their danger is so great, they are slain by all nations, but this is a special kind of killing that deliberately sends them into berserk mode (from which no Alpha Stigma (except Ryner – once) recovers by themselves) and crystallizes their eyes as yet another source of power. Throughout this, there are dark forces inside Roland which are attempting to corrupt Sion, even as notable and very good characters are trying to fight for his ideals. The problem is really quite simple: without power, nothing can change. Without corruption, there is not enough power. But with corruption and power, can anything change for the better? Well, things don’t change for the better. They go to very dark places, all in the shadow of great legends and great wars. The genie is out of the bottle, and large scale magic functioning as a poor man’s WMD is just the start of it. In novel form, Legend of the Legendary Heroes was followed by Legend of the Great Legendary Heroes, which I have read half of. So, this show’s final episode – which some may find to be a bit rushed – was cramming in all the stuff in the final novel that sets up the next series of novels, and likely sets up a second anime series. Put bluntly and without spoilers, stuff gets real and the stage is set for BIG stuff. Big wars. Big dramatics. Big clashes. Big-time magic. In terms of the plot, this series – as much as it did – was just a warm-up. So, this series was never going to resolve anything. Not from the start. When all is said and done, I do recommend seeing this show. Not for the plot, which saddens me. But for the characters I really have taken to love and care for. I really hate the fact many of them get such a terribly rough ride, but it’s not over yet, in many senses. The point is, the experience is there. There is a lot of art here, and it should be experienced, enjoyed and treasured for what it is. I trust that you, too, will be wanting to see more when all is said and done. 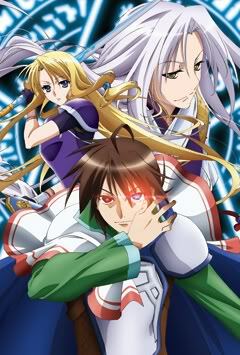 This entry was posted in Anime, Art, Culture, Japan and tagged 2010, anime, densetsu, eiyuu, fall, Japan, legendary heroes. Bookmark the permalink.